In The Mismeasure of Woman, social psychologist Carol Tavris writes about “the stories women and men tell about themselves and one another, and about the scientific stories that society favours”. The book specifically examines the idea that men represent the standard of “normalcy and universality” while women are “other”, and the impact this idea has had on field such as medicine, psychology, the law, linguistics, and politics; as well as on society in general. Carol Tavris rejects the notion that women are the opposite of men, that they are inferior or superior to men, or that they “complement” men. The Mismeasure of Woman clearly takes an anti-essentialist position, but it nevertheless acknowledges that gender has a deep and visible impact on people’s life experiences – and this is why the assumption that “human” equals “male” is such a dangerous one to make. Much like “colour-blindness” means assuming that white is the universal standard and dismissing the experiences of those who lack white privilege, “gender-blindness” often means assuming that women’s experiences are a negligible minority interest. To deny that men and women differ in their basic natures, personality traits, and abilities, as I have done in the previous two chapters, is not to deny that men and women differ at all. Of course they do. They differ in the life experiences that befall them. They differ in the work they do, at home and at “work”. They differ in reproductive processes. They differ, most of all, in power, income, and other resources. By ignoring these real differences in men’s and women’s lives and bodies, people who take the normalcy of men for granted have fallen prey to a third error: generalising from the experiences and even the physiology of men to all humanity on the grounds that everyone is like men—and usually a narrow band of middle-class white men, at that. I had to bold that last sentence, because it’s probably my favourite in the entire book – and I should warn you in advance that I’ll be quoting it a lot in the future. Reading it really helped me make sense of why the victim-blaming language people often use to discuss women (or fictional characters) they perceive as “spineless” bothers me so much. Thinking of subservience exclusively in terms of mental illness, personality disorders, or personal failings is especially problematic if we consider that “women get much more sympathy and support when they define their problems in medical terms rather than in political terms.” Focusing on the “dutiful wearer” rather than on the straitjacket is thus far more comfortable and far less threatening of the status quo: it tells us that individual women need to change, rather than that the social system in which gender roles are defined needs to change. Tavris similarly addresses the processes that influence how we perceive female sexuality or women’s reproductive processes. The sections about PSM and menopause were particularly interesting: Tavris acknowledges that syndromes can be empowering because they “give a medical and social reality to experiences that were previously ignored, trivialised, or misunderstood”; but at the same time, she cautions that they can be used to pathologize natural body processes – and this is how we go from menopause to an “estrogens deficiency syndrome” that requires medical intervention. The view of menstruation as a monthly wound from which women must recover, along with the view of its sister sickness, menopause, are subtly enshrined in our language as processes that involve weaknesses, losses, and debilities. The Mismeasure of Woman was first published in 1993; because science books usually begin to show their age only a couple of years after publication, I expected to find much here that was clearly dated. But you know what? Very little has changed. It was only the occasionally reference to events from the late 80’s and early 90’s that made me realise I was reading a book that was close to twenty years old. And as happy as I am to recommend the excellent The Mismeasure of Woman as relevant to our times, I also find that incredibly depressing. Personality traits, abilities, values, motivations, roles, dreams, and desires: all vary across culture and history, and depend on time and place, context and situation. Of course, if you photograph the behaviour of women and men at a particular time in history, in a particular situation, you will capture differences. But the error lies in inferring that a snapshot is a lasting picture. What women and men do at a moment in time tells us nothing about what women and men are in some unvarying sense—or about what they can be. The mismeasure of woman persists because it, too, reflects and serves society’s prejudices. Views of woman’s “natural” differences from man justify a status quo that divides work, psychological qualities and family responsibilities into “his” and “hers”. Those who are dominant have an interest in maintaining their difference from others, attributing those differences to “the harsh dictates of nature”, and obscuring the unequal arrangements that benefit them. None of this means that biology is irrelevant to human behaviour. But whenever the news trumpets some version of “biology affects behaviour”, it obscures the fact that biology and behaviour form a two-way street. Hormones affect sexual drive, for instances, but sexual activity affects hormone levels. An active brain seeks a stimulating environment, but living in a stimulating environment literally changes and enriches the brain. Fatigue and boredom cause poor performance on the job, but stultifying job conditions produce fatigue and boredom. Scientists and writers who reduce our personalities, problems, and abilities to biology thereby tell only half the story, and miss half the miracle of how human biology works. By relegating to women’s nature what ought to be the human qualities of feeling, attachment, connection, and care, we overlook men’s capacity for these qualities or absolve them of responsibility for not demonstrating them. We will all do better to specify what it will take for men to become more related or connected (or to admit that they already are!) than to dismiss them as hopelessly lacking this “female” skill. “The more we continue to glory women’s ‘special’ nurturing and caretaking abilities as a ‘separate but equal’ line of development,” says Harriet Lerner, the less likely it is that men will be able to recognise their own competences in this arena. The prevalent inclination to regard masculinity and femininity as permanent personality traits has overshadowed the importance of the context in which men and women live. In their everyday lives, men and women often behave in “feminine” ways (for example, when they are playing with their children or providing a supportive shoulder for a friend to cry on) and sometimes men and women behave in “masculine” ways (for example, when they are competing for a promotion). But by regarding masculinity and femininity as polar opposites, with one side usually better than the other, we forget that, in practice, most of us “do” both. I'm not sure what to say. Except for "Thank You!" Again. This post is simply awesome, Ana. It's not just that you introduce me to awesome-sounding books on a regular basis, it's that you never let me stop thinking. I am off to the library website immediately to put this on hold (they better have it!). Wonderful review, Ana! Liked it very much. 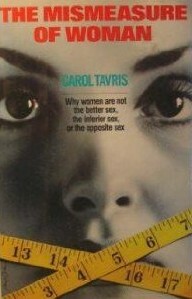 I liked this sentence very much - "Carol Travis rejects the notion that women are the opposite of men, that they are inferior or superior to men, or that they “complement” men." - especially the 'complement' part. I also liked this sentence very much - "Much like “colour-blindness” means assuming that white is the universal standard and dismissing the experiences of those who lack white privilege, “gender-blindness” often means assuming that women’s experiences are a negligible minority interest." If we use some simple statistical measures that everyone uses in research (both for the physical and social sciences) like the median and the mean, we can see that 'white' or 'man' is not the typical human experience today (that is today if we pick a human being at random, chances of that person being white is less than 50% and chances of that person being a man is around 50%). If I can recommend a documentary, I will suggest 'Secrets of the Sexes'. I watched it a few years back and found it quite interesting. I found this review fascinating, and think that this book would open my eyes and teach me a lot. There seem to be a lot of interesting ideas here, and the fact that you relished this one makes me think that I could probably learn a lot from this book. Thanks for the very eloquent and thoughtful review today. This book goes on the list! I remember when this book first came out! I read lots about it but never got around to actually reading it. How depressing that it is still so relevant. the behaviour pattern defined as “codependent” is exactly what women were traditionally brought up to believe they should embody (and in many contexts they still are). Oh my god yes this so much. And I feel like I have a double whammy being raised in an evangelical Christian home! I want to read this book now. This sounds fascinating! I've lately noticed more and more how I read books from/about the 1950s or watch Mad Men and think "how modern they were". Actually, I need to revise this and think "how backwards we still are!". I feel like the continued relevance of The Mismeasure of Women belongs in this category too. This sounds very thought-provoking, especially the medical chapters and sections about mental illness. I really liked this quotation: "women get much more sympathy and support when they define their problems in medical terms rather than in political terms" (I think this is often the only way women can be taken seriously) and also this: "gives a medical and social reality to experiences that were previously ignored, trivialised, or misunderstood". I find these ideas very interesting! This sounds like a very complex but worthwhile book. Does she talk about The Invention of Hysteria by Georges Didi-Huberman at all? Want want want want want. The quotes you shared are incredible, especially the ones about focusing on the straightjacket and not the wearer. SO true. I read this years ago (and enjoyed it) but found it a little dry compared to others who have covered the same ground. Also, I was reading a lot of feminist theology at the time, and reading about how our views of God have divinized our views of men and thereby prohibited a wholly positive view of women - well, that was some fascinating reading and I think it made me a little bored with straight sociology. Great review, you picked some fine passages to quote (as always). I just saw the movie Miss Representation and I think it covers similar ground to this one. It was a really eye-opening documentary about the way the media portrays women and how that is very detrimental to men and women today. Also really frustrating to me, as someone who likes solutions, was that it presented small things people can do to make some changes, but nothing big or really meaningful, sadly, that would create a sea change.